Chronogram magazine, launched in 1993 to chronicle life in the Hudson Valley, is celebrating its 20th anniversary with a massive Block Party on Saturday, August 17, from 4-11pm. The Block Party will take place on Wall Street in Kingston between John and North Front Streets in the historic Stockade district. The Chronogram 20th Anniversary Block Party is sponsored by WDST Radio Woodstock, BSP Lounge, Health Quest, Dr. Tom Cingel, DDS, Ulster County Savings Bank, Bard College, and Mountain Laurel Waldorf School. —Musical acts including Superhuman Happiness, Crystal Stilts, The Big Takeover, Dog on Fleas, and Passero. 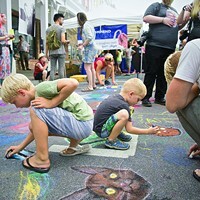 The Block Party will provide entertainment for Chronogram fans of all ages. For the kids: A DIY art tent, popular children’s band Dog on Fleas, and a dunking booth to benefit the Kingston YMCA Farm Project. For the adults: swing dancing with Got2Lindy, age-appropriate music, a beer and wine garden, and an after-hours masquerade dance party at BSP Lounge. “The Block Party will complement Chronogram’s mission to nourish and support the creative life of the Hudson Valley. We’re excited to be celebrating our 20th anniversary with the Chronogram community on the street in front of our office. We look forward to spending the evening with our fans from across the Hudson Valley as we ring in the next 20 years,” Publisher Jason Stern says. The Chronogram Block Party will bring together the magazine’s readership for an exciting evening of great music, community, and celebration. Wall Street may never be the same! Great classics...great new rock. Bob Dylan, Avett Brothers, Jimi Hendrix, Jackie Greene, The Kinks, Florence and the Machine, Dave Matthews Band, Pink Floyd, Neil Young, Beth Orton, Gov’t Mule, Steely Dan, Sting. Independent radio for the Hudson Valley. The Band, The Lumineers, Adele, Janis Joplin, The National, Mavis Staples, Jack Johnson, Dawes, Michael Franti and Spearhead, Fleetwood Mac, Lucinda Williams, Fitz and The Tantrums, U2. Programmed by humans. Oasis, The Allman Brothers Talking Heads, Bob Marley, Paul Simon, Gary Clark Jr., Queen, The Lone Bellow, Elvis Costello, John Lennon, The Cars. Radiowoodstock.com. Crosby, Still and Nash, Eric Clapton, The Beatles, The Stones, Pearl Jam, Laura Marling, Jackson Brown, The Black Keys, Jimmy Cliff, The Felice Brothers, Peter Gabriel, R.E.M, Jefferson Airplane. Corporate-free radio. Tedeschi Trucks Band, The Ramones, Bonnie Raitt, Mumford & Sons, The Grateful Dead, Amy Helm, Phish, Blondie, The Who, The Lone Bellow, Elvis Costello, Oasis, The Allman Brothers, John Lennon, Vampire Weekend, Traffic, Led Zeppelin and many, many more. Nobody owns us! BSP—located in the heart of uptown Kingston—is quickly becoming a mainstay for the art and music scene in the Hudson Valley. Built as a vaudeville theater in the 1800’s, it spans the entire block from Wall Street to Crown Street. With a focus on independent culture and community, the venue has become home to some of the most interesting artists from the Hudson Valley and beyond. Evenings featuring national acts such as Marco Benevento, Man Man, Neko Case, and AC Newman are common fare, but the venue showcases local as well as regional talent weekly. The building also boasts a NY state certified sound stage for film production and large events as well as a fully operational dance studio. As annual hosts of the O+ Festival, Wall Street Jazz Festival, and two film festivals, BSP is known for its top quality, ever-evolving activities. 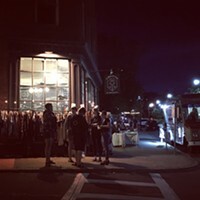 The Chronogram Block Party is BACK for Year 5!